Finally after two years of screwing around and getting the HKS engine systems installed and working, today was initial flight test day. I did two early morning high speed taxi runs down the runway, then five "crow hops" from 5 feet to 50 feet AGL down the runway. Early morning before the tower opened (none of the radio equipment I tried to use would work) , then later in the evening (after the tower closed at 8PM local) one 10 minute flight doing ovals around the runway at 500 AGL. Elevator and rudder light on the controls, ailerons heavy. This will need to be addressed one way or another. Required 2 or 3 pounds of forward pressure on the stick for level flight. Indicated airspeed 50-55 MPH, no idea if this is accurate or not. Takeoff very short, did not attempt minimum speed landings yet. Ground steering sensitive but effective. "Deck Angle" in flight was much different than I had imagined. In order to maintain level flight the instrument panel was way way down low below the horizon. Lots lower than where I thought it should be. That is just my inexperience with the Kolb and UL style aircraft in general. HKS engine ran well once warmed up. No sagging or "wandering" in flight. Maximum RPM in flight was 5750, I retarded the throttle to keep it below max continuous RPM (5800). Might be adding one degree of pitch to the prop blades. My biggest mistake was due to inexperience with this type of aircraft.... when I was at 500 AGL it looked to me like I was at 1500 AGL. I thought the altimeter was wrong, but my ground crew and friends said "yep, looked like you were at about 500 feet." I was shocked, I thought I was much higher than that! something lower like a milk crate would be needed. keep it on that side instead of the main hangar. one near the tip. Worked OK. Not great, but OK.
Congratulations, Bill. Enjoy the view. Sounds like it flew pretty well to me. Heavy ailerons aren’t unusual on Kolbs. I’d go out and concentrate on learning to fly your new toy instead of changing things. I guess it's safe for me to make a comment this morning. I've have a couple cups of coffee. Reread what my friend George H wrote below. Best advice you will get this morning, in my humble opinion. Ailerons on Kolbs are heavy because you have a lot of aileron for that big wing. That's the way Homer Kolb wanted it. His idea of flying a Kolb was low and slow, right down in the tree tops, with plenty of aileron authority right through the stall. Kolbs are not Pitts or F-16s. Don't expect them to be. 34 years ago I was concerned about the heavy ailerons on my Ultrastar, then my Firestar, and my MKIII. Coming out of helicopters it seemed to take a ton of strength to fly it like I would a helicopter. Homer Kolb always told me to be gentle and the Kolb will do what you want it to. It is not a yank and bank airplane. I don't know of any old experienced aviator that flies "yank and bank". Most all are very smooth, gentle pilots, especially on the ground. Slow down...the ailerons will get lighter. Increase speed and increase aileron resistance. Unless you changed something in the aileron controls, they should be ok. Some of the older Firestar II's had some problems with the Homer designed universal joint on the aileron torque tube. Brother Jim Hauck, while working and helping New Kolb Aircraft get organized in London, KY, in 1998, solved that problem by convincing Kolb to change to a sealed aircraft universal joint. Much more expensive, but a much better system. I got the same sensation when I first flew my Kolb. Felt like I was going to tip over forward. Takes a very short time to get used to level flight attitude. It may be different from "real" airplanes. Over many years I have discovered that a prop, boat and airplane, should be pitched to achieve the rpm red line when flying wide open throttle, straight and level flight. That will give you the best climb and cruise performance with a in flight fixed pitch prop. You probably weren't flying WOT when you were turning 5750, but that seems like a good place to stay until you learn how to fly the Kolb. You can repitch later on down the road when you get some experience flying the bird. Different perception in altitude, now you are experiencing what real flying is all about. Nothing like flying a Kolb. A few of us have addressed the heavy aileron condition by redrilling the attach point connection of the control rods inboard 1” on the control tube angle flange. Not much change in effectiveness but noticeable change in required effort. Did this on the FS2 and MK3C as well. > Finally after two years of screwing around and getting the HKS engine systems installed and working, today was initial flight test day. > I did two early morning high speed taxi runs down the runway, then five "crow hops" from 5 feet to 50 feet AGL down the runway. Early morning before the tower opened (none of the radio equipment I tried to use would work) , then later in the evening (after the tower closed at 8PM local) one 10 minute flight doing ovals around the runway at 500 AGL. > Elevator and rudder light on the controls, ailerons heavy. This will need to be addressed one way or another. > Required 2 or 3 pounds of forward pressure on the stick for level flight. > Indicated airspeed 50-55 MPH, no idea if this is accurate or not. > Takeoff very short, did not attempt minimum speed landings yet. > Ground steering sensitive but effective. > "Deck Angle" in flight was much different than I had imagined. In order to maintain level flight the instrument panel was way way down low below the horizon. Lots lower than where I thought it should be. That is just my inexperience with the Kolb and UL style aircraft in general. > HKS engine ran well once warmed up. No sagging or "wandering" in flight. > Maximum RPM in flight was 5750, I retarded the throttle to keep it below max continuous RPM (5800). Might be adding one degree of pitch to the prop blades. > My biggest mistake was due to inexperience with this type of aircraft.... when I was at 500 AGL it looked to me like I was at 1500 AGL. I thought the altimeter was wrong, but my ground crew and friends said "yep, looked like you were at about 500 feet." I was shocked, I thought I was much higher than that! > something lower like a milk crate would be needed. > keep it on that side instead of the main hangar. > one near the tip. Worked OK. Not great, but OK.
My Mark III Xtra also has a nose down position in level flight. It is much different from the 152's, 172's and J-3's that I've flown. I still occasionally find myself climbing thinking that I was descending when I was really flying level. The plus side is that this attitude gives you a fantastic view! THANK YOU John H and everyone else for your comments. Please tell me more about a universal joint in the aileron torque tube?!?!? Are you referring to the U-joint in the steel tube under the seat on the aircraft centerline or are you saying there is a U-joint in the aileron tube itself on the wing? My ailerons are very easy to move with two fingers when the aircraft is on the ground, but in flight with air loads on the wings the ailerons are heavy. I am not loooking for an aerobatic or air combat maneuver airplane, but I am hoping to have the Kolb aileron control as light and responsive and pleasant as the Kolb rudder and elevator are. are not Pitts or F-16s. Don't expect them to be. to be gentle and the Kolb will do what you want it to. Firestar II's had some problems! joint. Much more expensive, but a much better system. flight attitude. It may be different from "real"
cruise performance with a in flight fixed pitch prop. road when you get some experience flying the bird. you are experiencing what real flying is all about. Nothing like flying a Kolb. Congratulations, Bill. Enjoy the view. learning to fly your new toy instead of changing things. Bill, John H. Is absolutely right. The faster you push the wing through the air, the heavier your ailerons will get. Conversely, the slower you fly the lighter they become. The hinges are only offset of center to provide you with differential effect. That cuts down on adverse yaw. Concentrate on learning to fly your airplane in its present setup. You will find after a few hours that it’s quite nice to use a little side stick pressure then using a bunch of side stick travel. Your plane sounds like it flying properly. Become more of a flyer and less of an engineer. Learn to land the thing with that strange gear. Keep your airspeed up on approach for the first few hours. Like Homer Kolb said so many years ago. The firestar has heavy ailerons. Nothing much you can do, other than move the control rods closer to the center. I tried it but didn't like it. I have gotten used to using my knees to assist. It's just part of having a Kolb. If you go slow enough they are fine. Too fast and they are stiff. There have been some experiments with spades, but nothing of definite results. You will either get used to it, or get something else. joint.� Much more expensive, but a much better system. flight attitude.� It may be different from "real"
� � -Matt Dralle, List Admin. First, congratulations on your first flight. That is always a milestone no matter how many times you have done it. Second, it sounds like your plane is performing just as it should. My Kolb is a Firefly so my experience is only similar. Third, the other guys are correct. At this point the only reason to go making changes is if you have a serious problem like one wing is so heavy it will barely fly level. Keep flying and getting to know your bird. As long as it is not showing any dangerous traits leave well enough alone until you have become intimate with the flight characteristics over the entire envelope. You can change the mechanical advantage of the aileron push tubes by moving the bottom ends inward but don’t forget you trade travel distance for that advantage. This may be well and good in calm conditions but believe me when I tell you that I have found myself needing every bit of length of throw at the stick end of things on more than one occasion. It was not my intention to fly in those conditions but they do happen. You sure as heck don’t want to run out of aileron travel when you need it most. This is most noticeable at slower speeds and where are you likely to be at those slower speeds but on takeoff or approach the most notably critical portions of flight. When you are up cruising around at the upper end of the speed envelope and the ailerons seem “heavy” just remember that you don’t need much movement to accomplish your desires so the amount of force is not that great. The best advice I got when learning to fly the Firefly was to put my elbow on my leg and fly with my fingers. It worked and proved that it really does not take that much force to roll the wings. So keep flying and keep analyzing and keep thinking before you go changing anything. After all your hard work to get airborne go enjoy it! My bet is you will start having so much fun when you are not over thinking things you will actually forget to think about them. Fourth, Congratulations! Now go do it again! Plan to fly for many hours with the ailerons just like they are. Heavy ailerons are perfectly normal for a Kolb. Once you know your airplane inside out, you might want to try drilling a couple of holes in the aileron bellcrank a bit closer to the pivot point and moving the bottom ends of the aileron pushrods closer to the pivot; it will change the leverage arm and the ailerons will become much lighter. You will lose some aileron deflection. Possibly some control authority. Some on this list think that is anathema, others are comfortable with it. Your call. But after you have 50-75 hours in your airplane, you will be able to decide for yourself, and if you don't like it; you can put them back like they were. In the meantime, everything that Stuart, John and Larry - among others - have said is absolutely correct. Kolbs have heavy ailerons, and they fly just fine with heavy ailerons. So do Stearmans. Thanks to everyone again for participating in this discussion. One of the things I noticed on my brief flights so far is that I am holding the stick forward with a few pounds of force for level flight. Not "excessive" force, but it would get tiring after 20 or 30 minutes. There were no trim tabs on this aircraft when I got it, and I have not yet installed anything. Is it considered acceptable or advisable to raise the leading edge of the stabilizer by moving the forward attach bracket upwards by 1/8 or 1/4 inch, essentially changing the "decalage" angle? This would seem like it could be a better solution that a bent aluminum trim tap riveted to the elevator. I think I have seen this described on one of the builder's websites in the past, but I have also seen photos of simple trim tabs. There are of course a number of other methods, including springs, bungees, model airplane servos, etc. etc. What I would like to ask the group is if one method is considered better, or more appropriate than others. You will lose some aileron deflection. that is anathema, others are comfortable with it. Your call. can put them back like they were. just fine with heavy ailerons. So do Stearmans. wonderful, and God's grace really is amazing. Droop the ailerons a tiny bit at a time. Test fly after each adjustment. Only do one adjustment at a time, but you already knew that. Drooping the ailerons will pull the nose down. Increasing the angle of attack on the horizontal stabilizers will also lower the nose a little, but drooping ailerons is easier. Nothing wrong with trim tabs. I had one on an aileron, rudder, and elevator, on my Firestar. Fabricated out of .016 6061. Worked perfect. As speed increased the trim tab angles would decrease a tad. Somehow it kept the Firestar trimmed in all 3 axis all the time. I could let go of the stick on climb out and the FS would hold its attitude. Is it considered acceptable or advisable to raise the leading edge of the stabilizer by moving the forward attach bracket upwards by 1/8 or 1/4 inch, essentially changing the "decalage" angle?� This would seem like it could be a better solution that a bent aluminum trim tap riveted to the elevator. I think I have seen this described on one of the builder's websites in the past, but I have also seen photos of simple trim tabs. Yes this is a common practice. Did that on my MKIIIC. I have also seen brackets that were made to allow the forward stabilizer to be moved up and down to a number of different holes, they may be factory options. Kolb does sell a optional universal joint that allows the wing angle of attack to be fine tuned by moving washers around. Our planes fly best when properly rigged. Trim tabs are usually a poor solution. Rudder trim is the exception. Yes drooping the ailerons, trim tabs etc. will work but why not fix the problem. 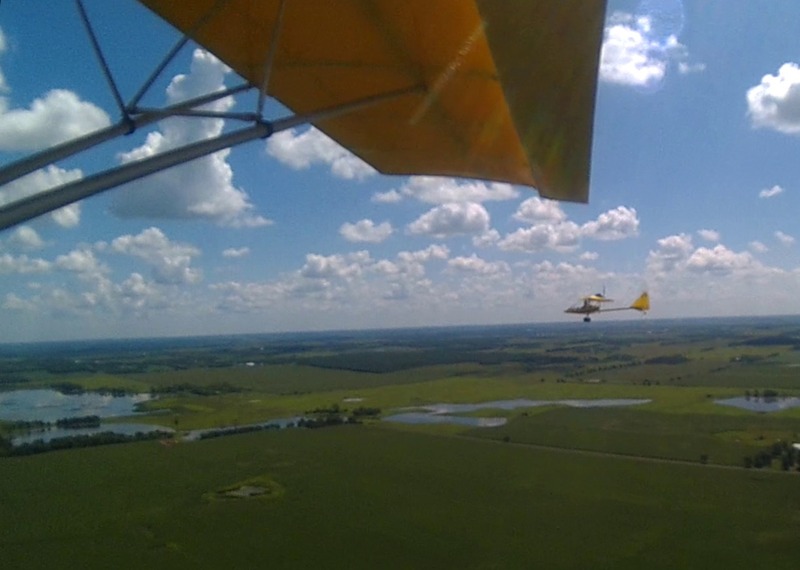 An airplane flies faster using less fuel when they aren't using control surfaces to fix rigging issues. You are in a most dangerous point of learning to fly your Kolb. You are/were a GA pilot and that works against you now. Take things slow. Don't rush into the slow flight landings. I know where you are at. All it takes is one approach to landing no power, maybe a slip too, You will see the ground approaching much faster than you are used too. You experience and training will kick in and will start your flair at 20-30'. With little extra airspeed, lots of drag and little inertia.......Just don't do it. Do you like rebuilding airplanes? I don't know of anyone, Kolb Aircraft included, that can build a Kolb that is rigged perfectly first time around. If a builder does end up with a perfectly rigged Kolb on his first try, it is probably a lot of luck involved. So many variables affect the rigging on a Kolb when it is being built, covered, and finished. I'm very limited in my knowledge of factory built GA aircraft. The ones I flew had pitch, roll, and yaw trim. It is necessary to set up the aircraft to fly without adverse pressure on the stick. Pilot won't last long on a long cross country unless he can fly without unwanted pressure on the stick and rudder pedals to keep the aircraft in trim. Passengers, cargo, fuel all play a big role in aircraft trim. Constantly changing. My MKIII has a very simple bungee trim for roll, forced trim for pitch (never needed anything but nose up trim), and a very large rudder trim tab for yaw. Proud to say my system works just as good as "store bought". If your trim problems are exaggerated, you probably have a more serious rigging problem that requires some rerigging. Changing the incidence of a wing with the part that Steven Green designed many years ago could be called trim and/or rerigging. Same for changing the incidence of the horizontal stabilizer. I believe drooping the ailerons, trim tabs, changing incidence of wing and horizontal stabilizer, are rerigging and trimming. They are not a poor solution. If trim tabs and forced trim were a poor solution they wouldn't use them on many aircraft (and that is a bunch of aircraft). Our Army helicopters, many years ago, used forced trim on the cyclic. We didn't have trim on the anti-torque pedals. Wasn't needed because there was not that much back pressure to overcome. We used friction to keep the collective in place. Respectfully disagree with my buddy Rick N's comments below, reference trim tabs. I believe his MKIIIs rudder trim tab works great. If not, it should. Yes, apparently all the Kolb's have different trim characteristics. When solo I have to have a little nose down trim. I do this by moving the flaps down 5 degrees. ( I have 9 lockable positions on my flaps). With a passenger I need the standard spring force up trim. I also have an adjustable aileron trim and the standard rudder trim tab. John is right. Passengers, fuel amount, baggage all change the trim. You either have to live with it or use adjustable trims to compensate. My trim issues are definitely MINOR. Please forgive me if I let anybody think this was a major issue. It is not at all. Although I have a grand total of under 20 minutes of flight time on this aircraft, during that time I did not notice any significant wing heaviness, tendency to pull left or right in yaw, or any sort of significant vibrations, thumping, bumping, or threatening noises or feelings from the airframe. Obviously I have not had time to let go of the controls, or "feel" any sort of subtle feedback from the airframe at this early stage. I also have not had the inclination yet to experiment with throttle settings and different airspeeds. It is entirely possible that the nose will come down at lower airspeeds, but at lower speeds I will probably be using less power, and the engine will be producing less "nose-down" force from the high thrust line. It may or may not require more or less push on the stick at different speeds, which I will definitely be checking on the next flight. Another thing that surprised me: I had assumed the big tires and the long gear legs (tires further below the aircraft) would be pulling the nose down and forcing me to pull back on the stick. This was not the case. I am also assuming that the big tires will cause enough drag to slow the airplane's "cruise speed" down some amount. The highest indicated airspeed I saw on the brief period of level flight was 55 MPH IAS. So this is meant to say that there are plenty of small drag reduction things that I can do in the future AFTER I learn how to fly the airplane. Again thanks to everyone who is participating in this discussion, I am happy to have all the different opinions and experiences of more experienced Kolb pilots. and the standard rudder trim tab. John is right. Passengers, fuel amount, baggage all change the trim. We have been dancing around this subject for a few years so it seems this is a good time to explain why I don't like to use trim tabs any more than necessary. Induced drag is the drag you get when you have the airplane do something useful like throwing air at the ground to make lift. Flaps are a good example of how their deployment effects an airplane and it is easy to understand how they work. Depending on the amount of deployment they produce different amounts of drag and lift. With just a bit of deployment they produce more lift than induced drag and at full deployment mostly induced drag and little lift. But flaps and drooped ailerons aren't very efficient in producing lift without inducing a higher amount of induced drag than say a wing. A side effect of flaps on a Kolb airplane is that it shifts the center of lift aft causing a nose down trim change. Most people will not cruise with their flaps down because it slows your plane down. Some people have even found that raising their flaps and ailerons a bit will add speed. There is also a very short moment arm for changing pitch trim with ailerons as apposed to the tail where the moment arm is much longer. The induce drag would be an order of magnitude greater with ailerons changing pitch trim than at the tail. So why would you fly in cruse with your ailerons drooped? Bill has an airplane that pitches down in cruise. The horizontal stabilizer is pulling the tail down too much so Bill has to push the elevators down to compensate. In other words his horizontal stabilizer is throwing air up and the elevators are throwing air down to keep the plane level. The horizontal stabilizer and the elevators are causing wasted induced drag while they are fighting each other. Adding a trim tab to the elevators adds even more induced drag as it is throwing air up to lower the elevators. If you have a 1.5 to 2 passenger Kolb you will have a trim spring and you will need it for passenger flying. If you fly with a passenger all the time rig your plane for the passenger and may be reverse the trim spring. So just learned Steven Green designed the universal joint adjuster, not to surprised he is a very smart guy. I used Steven's adjusters to get my MKIIIC flying level flying solo in cruise with no control pressure tabs or bungee. More than 90% of my flying is solo so that is where I set my all my rigging. With a passenger I need a small amount left aileron pressure but never enough to be tiring. Never noticed any aileron pressure when loaded with a aux fuel tank and a weeks camping gear. The rudder trim is a problem. As John says moving the vertical stabilizer doesn't help. I moved mine and it didn't noticeably help, had to put a trim tab on the rudder but the vertical stabilizer is still moved off center (can't hurt). As John says the trim changes depending on the load. Set your rigging to fly as level as you can get it in your normal cruise loading. Don't rig your plane to fight other parts of your plane to fly right.